Great photos are the theme of this newsletter. 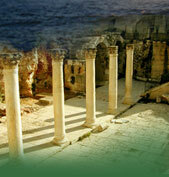 We begin with a notice about two beautiful calendars with photos of biblical sites. We continue with an announcement that our resources are now more widely available around the world with the addition of our Spanish version of BiblePlaces.com. And we conclude with our favorite photos from the best viewpoints in all of Israel. In our most recent newsletter (way back in May) we indicated that we would have a big announcement at the end of the summer. It turns out that we were too optimistic about our ability to work fast, especially when dealing with quantities higher than 10,000. We anticipate completion of our best project ever sometime after the New Year. The next newsletter should have all of the details, but the featured photos below will give you a preview. Finally, if you see me next week at the annual meeting of the Evangelical Theological Society in San Francisco, say hello and ask what's in my bag. Our photos are featured in a couple of calendars for the coming year. Recently on the blog, we recommended the calendar from Lamb and Lion Ministries with the theme of the "Galilee of Jesus" (available for $5 here). 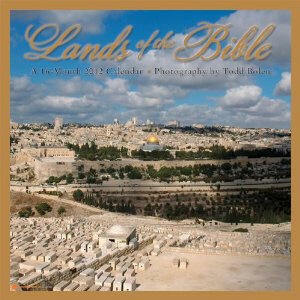 A second calendar entitled "Lands of the Bible" has been produced by Orange Circle Studio. This collection of many of my favorite photographs is available in retail stores around the United States as well as from Amazon ($11 here). The calendar includes two photographs each month of such places as Jerusalem, En Gedi, the Wilderness of Judah, Ephesus, Corinth, and Rome. These calendars make affordable and attractive gifts that will please the recipient all year long. We have been developing LugaresBiblicos.com for several years and the website is now online and available to users throughout the Spanish-speaking world. Everything has been translated by an expert with results far superior to what one gets from an internet translation service. If you have friends who would benefit from this resource, or if you have a website/blog, we would greatly appreciate it if you spread the word about LugaresBiblicos.com. Not quite so new, but still worthy of attention is the French version at BibleLieux.com. My favorite spots in Israel are those where I can "see it all." By "all" I am referring to history, though if a history-rich scene is also beautiful, I enjoy it even more. For the featured photographs this month, I have collected the best shots from my favorite vantage points in Israel. Each of these viewpoints overlooks the locations of multiple biblical stories. If you have been to Israel but have not been to each of these places, I would encourage you to make a note to get there on your next trip. While we always feature the photographs in PowerPoint format in addition to the standard jpg format, for this particular collection we highly recommend that you download the "Favorite Views in Israel" PowerPoint presentation (2.3 MB) so that you can see the labeled versions of the images. A limited version is also available in pdf format. Click picture for higher-resolution version. Download the PowerPoint presentation for a labeled version of all of the photos. From the top of Mount Arbel, one has a spectacular view of the northern end of the Sea of Galilee. The fertile Plain of Gennesaret lies immediately below the mountain, with the city of Magdala at its southern end and the traditional Mount of Beatitudes on its northeastern side. The famous 1st-century boat was discovered along the shoreline of this plain where Jesus was once confronted by the Pharisees (Matt 15:39-16:4). The miracle-worker from Nazareth made his home in Capernaum on the northern shore during the years of his ministry (Mark 2:1). Across the lake the city of Bethsaida was the home of three of Jesus’ disciples (John 1:44, 12:21). Above the Sea of Galilee rise the mountains of the modern Golan Heights, the region known in the Old Testament as Bashan (Ps 68:15). The peak of Muhraqa on Mount Carmel not only identifies the traditional setting for the contest of Elijah and the prophets of Baal but it provides one of the best viewpoints in the country. Through the Jezreel Valley numerous armies marched on their way to fight the greatest battles of ancient times. Deborah and Barak once marched down Mount Tabor and stopped the Canaanite army when this plain became a swampy trap for the chariots (Judg 4-5). Gideon amassed his forces by the northern slope of Mount Gilboa before he ventured out against the Midianites camped next to the Hill of Moreh (Judg 7). Elisha traveled through this valley on his way to Mount Carmel, spending a night with a kind woman at Nain who was then promised a son (2 Kgs 4:6-37). Jesus must have heard these stories and more as he traveled from Nazareth to Jerusalem with his parents. From Mount Gerizim one can easily visualize the twelve tribes standing around Shechem and reciting the blessings and curses (Deut 27:12-13). Their ancestors Abraham and Jacob had spent time in this area (Gen 12:6-7; 33:18) and an important well became known after the father of the twelve tribes. Many years later the United Kingdom of those tribes was divided at this place when King Rehoboam refused to conciliate the northern tribes and relax the harsh measures imposed by his father Solomon (1 Kgs 12:1). A Samaritan woman who came from Sychar for water at Jacob’s Well was met by the Messiah who promised to satisfy eternally her true thirst (John 4). The rooftop of Nebi Samwil provides a spectacular view of the Central Benjamin Plateau. The youngest son of Jacob inherited land between the two dominant tribes of Ephraim and Judah (Judg 18:11). Consequently Benjamin’s history was one of turmoil as numerous battles were waged on its territory. In the days of the judges, the abuse of a Levite’s concubine resulted in eleven tribes trying to destroy the twelfth (Judges 19-20). Surprisingly the first king of Israel hailed not from Judah or Ephraim but from Benjamin, and Saul made his hometown of Gibeah the nation’s first capital. The proximity of Saul’s city to Ramah where the prophet Samuel lived makes all the more powerful the statement that “until the day Samuel died, he did not go to see Saul again” (1 Sam 15:35). From the viewpoint atop Herod’s fortress of Cypros, one can see the plains of Moab beneath Mount Nebo where the Israelites camped before being led by Joshua across the Jordan River (Josh 1-3). The ancient fortified city of Jericho (Tell es-Sultan) fell to the marching Israelites after seven days of trumpet blowing (Josh 6). The city was rebuilt in the days of Ahab in spite of the curse (1 Kgs 16:34). Across the Jordan River Elijah went into heaven in a whirlwind and when Elisha returned he caused the waters to part by striking it with Elijah’s cloak (2 Kgs 2). Herod and his predecessors built winter palaces in the area and Jesus often passed this way as he traveled from Galilee to Jerusalem (e.g., Luke 18:35-19:28). Azekah provides a beautiful view of the Shephelah and the Judean Hill Country to the east. The famous Elah Valley has been a convenient route for ancient and modern people alike. The Philistines chose this place to challenge the Israelites for control of the land and here Goliath mocked the living God of Israel (1 Sam 17). David would later pass through this valley on his way to and from Gath (1 Sam 21-22). The “Diagonal Route” passes through the Elah Valley below Azekah, providing a natural road for travelers headed north to Beth Shemesh and Aijalon or south to Maresha, Lachish, and points beyond. The Canaanites fled from Joshua along this route “as far as Azekah” while hailstones destroyed their forces (Josh 10:10). Please pass this newsletter link on to others. They can subscribe to this newsletter here. It is cost-free and spam-free. Email addresses will never be used for any purpose other than this newsletter. If you have questions about the subscription process, see this page. All contents © 2011 Todd Bolen. Text and photographs may be used for personal and educational use. Commercial use requires written permission.